Get stage-ready power and a wealth of awesome tones in a super-portable head. 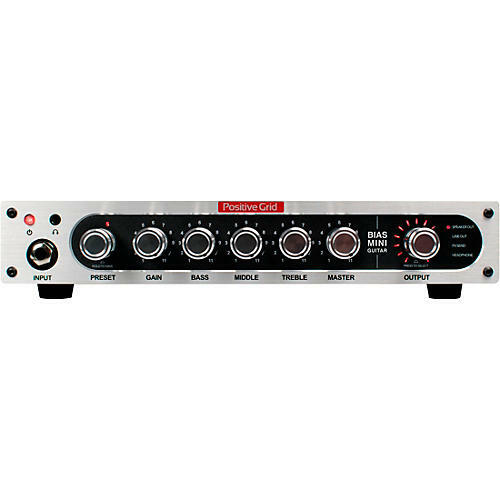 Building on the foundation set by its larger Positive Grid siblings BIAS Head and BIAS Rack, BIAS MINI Guitar squeezes the same advanced component emulation engine, authentic dynamic tube amp feel and wireless connectivity into an even smaller and lighter package. Weighing just over five pounds with a built-in 300-watt power amp, nothing else on the planet comes close to BIAS MINI for small-to-medium sized gigs and recording sessions. In the past, good tone was both expensive and heavy, but BIAS MINI turns that notion on its head. With a built-in power amp rated at 300 watts @ 4 ohms, there’s plenty of power on tap for medium-sized gigs and recording sessions, and at just over 5 pounds in a half-rack enclosure, there’s no longer any excuse not to take your favorite tones on the road with you wherever you go. Add to that a glitchless effects loop for your favorite effects and the ability to take pedals like a champ, and BIAS MINI makes the impossible possible. If you want to dive headlong into the world of amp customization, BIAS MINI comes with Positive Grid's amazing BIAS AMP Pro amp designer software ($199 value), which allows you to recreate the sound and feel of nearly any existing amplifier. Even better, it gives you the power to create an entirely new amp that is unique to you and the way YOU play. Connect via built-in Bluetooth or USB, and open up a world of component options previously only available with a soldering iron: choose between different preamp and power amp circuits, change the tubes and transformers, add clipping diodes and try out different rectifiers—all completely authentic and all in real time. It’s like having a boutique amplifier workshop at your fingertips. All BIAS products can connect to the Positive Grid ToneCloud, a cloud-based community the engineers created specifically for guitarists and musicians. It’s much more than just an online storage tank for sounds—it’s a place to discover new ideas and new tones. You can download new amps created by artists and recording studios, backup and share your own creations with other guitarists in the community and interact with other musicians with similar interests. BIAS AMP software features the ability to Amp Match, analyzing a source guitar tone and applying the necessary corrective processing to make a custom amp more closely match the original. Even if you don’t plan on matching amps yourself, you can still take advantage of the Tone Match feature by downloading custom amps other guitarists have matched from the ToneCloud.